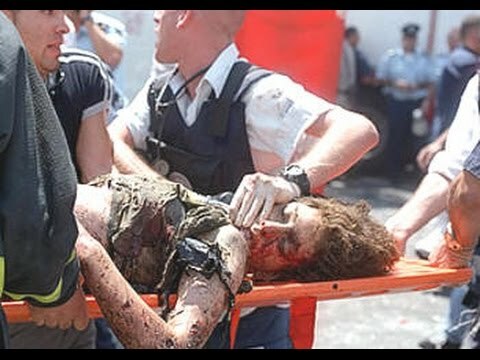 The Sbarro restaurant suicide bombing was a Palestinian terrorist attack on a pizzeria in downtown Jerusalem, Israel, on August 9, 2001, in which 15 civilians were killed and 130 wounded. At the time of the bombing, the Jerusalem branch of the Sbarro pizza restaurant chain was located at the corner of King George Street and Jaffa Road in Jerusalem, one of the busiest pedestrian crossings in Israel. Just before 2:00 p.m. on a summer holiday afternoon, when the restaurant was filled with customers and pedestrian traffic outside was at its peak, a suicide bomber thought to be carrying a rigged guitar case or wearing an explosive belt weighing 5 to 10 kilograms, containing explosives, nails, nuts and bolts, detonated his bomb. Fifteen people were killed in the attack, seven of them children, and 130 were wounded. Among the dead was a family of five (two adults and three children). The death toll would likely have been much higher, except that the building had recently been retrofitted to improve its structural integrity. The building was built with the same "Pal-Kal" construction technique deemed responsible for the Versailles wedding hall disaster less than three months before. Although not required to do so, owner Noam Amar added extra support columns on the advice of city inspectors.